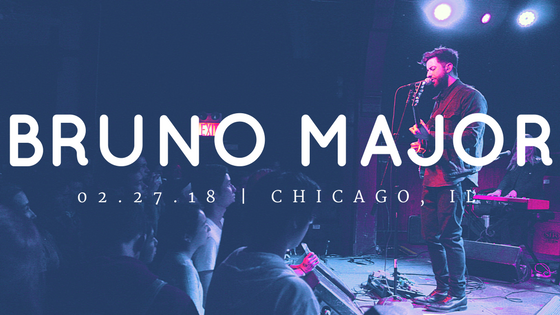 In the timespan of a week, British singer/songwriter Bruno Major made his television debut on The Late Late Show with James Corden, announced a spring U.K. arena tour with Sam Smith and played a string of sold-out shows across the U.S. – including Chicago. To say he’s started his 2018 off with a bang is an understatement. The sold-out crowd at Schuba’s Tavern was both mesmerized and engaged the entirety of Major’s performance. They were dead silent as each song began, they called out words of encouragement as he bantered with them and they made sure to document every moment of his set. The room felt as if this night was everything they’d been waiting for and Bruno delivered beyond expectations. As he walked on stage with his bandmates, lights of blue, red and white shone on each instrument and brought out the best features of each. It created an intimate setting, full of opportune moments for Major to make the crowd another crucial aspect of each song. While on guitar for most of the night, Major switches to piano for a few songs, including “Places We Won’t Walk”. He introduced the song as one that was originally a classic break-up song, but took on a whole new meaning after someone close to him died a week before he was scheduled to perform it live. He said that was his favorite part of songwriting – a song can take form based on a certain situation and transform into much more than it was meant to be. Major’s stage presence is talkative and, most importantly, comfortable. Hearing him address the crowd was like having a conversation with an old friend. When he wasn’t sharing the inspiration behind certain songs, he was making jokes about his guitar not being a fan of Chicago or how his encore was going to be slightly pathetic as there wasn’t a backstage area for him to run off to immediately after playing “Easily”. Knowing how to address an audience is a learning process in its own, and Major immediately clicked with his. His debut album, A Song for Every Moon, stemmed from a year-long challenge of releasing a song a month. From “First Thing You See”, one of the first songs he ever wrote, to “Cold Blood”, a completely different yet compatible vibe from the rest of the tracks, Major took this challenge as an extreme procrastinator and turned it into one of his biggest accomplishments to date. Bruno Major is having a hell of a year, and it’s barely March. As he finishes taking the U.S. by storm and wowing Sam Smith fans all over the U.K., he’s creating a devoted fanbase that will make sure his success continues to roll in.